November 27, 2015, 7:11 AM · Now that we are all set up, with the viola comfortably in hand (or on shoulder! ), it is time to start playing, and that means producing a sound, which, as we all know, is simple, right? It turns out that making a sound on the viola is not hard, but getting the best possible sound out of the instrument takes a bit more attention than it does on the violin. The violin is relatively forgiving--a wider range of bow technique will provide a decent sound on the violin than on the viola. The viola, however, poses some unique challenges. You may be aware that the viola is acoustically imperfect (it sounds like the setup to a viola joke, but it’s true). The violin and cello are sized correctly to resonate the range that they play. The viola (and the bass, in fact) is smaller than it should be to achieve its full acoustic potential. Both instruments would be virtually unplayable if they were the “correct” size. And, as you can imagine, it is in the low range of the viola that this “deficiency” (as some might call it) is most pronounced. “Wait, wait, wait!! !” I hear you scream, “Isn’t this what gives the viola its distinctive, dark character?! Why would we want to play an instrument that just sounded like a lower violin?” And you know what, you would be right. The particular acoustical “compromises” that allow the viola to fit under the chin are actually a great gift. They allow for a complexity of tone, a sophisticated overtone profile that truly expresses the depth of human experience and varies like a fine wine (? ), but ONLY if you can coax these depths of sound out of the instrument. Imagine, for a moment, that your strings are like roads. The contact point--that incredibly thin centimeter of space where the bow hair actually touches the string--is where the tires of your car hit that road. If you've ever driven a really nice car, and experienced the sensation that you could actually touch the road with your hands and feet through the feedback of the steering wheel and the pedals, you will understand how you can actually “feel” that point through your sensitive fingers (both hands!) when you play. And the more you feel the “road,” the more you become aware that each string is not the same kind of road at all. The A string? A smooth, fast highway. Move the bow and the contact point hums along almost no matter how fast you go. No trouble keeping your “tires on the road,” no trouble following the contours of the route. This road wants to be driven on, and taken at speed. It sings under your bow. What about the other end of the instrument, the C string? Well now, this one is a different road entirely. It is a beautiful road for sure, wooded, picturesque. But it can’t be taken at 65 mph. It would be dangerous to try! It's a dirt road with a lot of texture and grit, and you’d fly over the rocks and pebbles, without gaining any real footing (and you might even end up in a ditch). But also, why would you want to go so fast on it? This is a road that begs to be taken slowly. Open the windows, smell the flowers, drink in the scenery! And enjoy that sensation that you can still feel the road under your tires, the road is providing real resistance and forcing you to slow down, to engage with it. It may be a funny analogy, but it’s apt. Of course, as a violinist, you can appreciate that there is a similar difference between the violin’s E and G strings. But on the viola the difference is more extreme. And that matters, because although you can take the C string at “violin G string” speed and attention to detail--and you will get a relatively decent sound—it will be like driving down a pretty country road at 30 mph: you are bound to miss some things that you might notice at a slower speed, that Robin up in the tree, a deer hiding behind a bush. Those are the extra details that make the viola sound its best. OK, how to actually accomplish this. First of all, when we speak about getting weight into the string on the viola, it means real weight, actual weight. As in, the weight of your arm. If you’ve never thought about it before, lift up your right arm as if you were about to put bow to string, then have a friend put his or her hands under your arm and drop that weight into those hands. I mean it, drop it like dead weight. Your arm, when you don’t spend extra energy holding it up, is actually quite heavy. (mostly water, you know…). If you can direct that dead weight to the contact point (where the tires meet the road, remember? ), that’s a LOT of power available to you with minimal work. IN FACT, your main job in all of this is to direct that weight to the point where you want it to go. As simple as this seems, that means a couple of not obvious things: first, you need to know where you want it to go, and second, you need to KEEP it there. So, let’s address each of these in turn. Where do you want this weight to go? You want the weight of your arm to be directed to the contact point that fits the speed of the bow you want to use. Simply put, you have to stay in the correct lane. Just as you shouldn’t speed past a slow truck on the right, you shouldn’t try to pull a fast bow right up against the bridge. What happens? Right, you get that telltale ponticello sound, full of high overtones but lacking depth. (of course, if you’re looking for ponticello sound then that’s exactly what you should do!). What if, however, you slowed your bow to a crawl, and let the resistance of the string close to the bridge tug on your bow as you work to keep a consistent spin in the string? You can get a beautifully alive sound! At a point very close to the bridge, you could get this sound to last for 12-15 seconds or more in a single bow, and there are times that you may want to move the bow this slowly even when you don’t have to. If you want to move the bow faster, then of course you will move your bow further out from the bridge, but here is where you will need to be careful (!) On the viola, you will get some sense of lightness and easy ring out close to the fingerboard with a speedy bow. But that sound, especially on the lower strings, can be too transparent. In a hall, a sound produced out there will create a wash of sound with very little definition and center to it, even though it may sound perfectly good under your ear. Sometimes you will need to go a touch closer to the bridge than your intuition will dictate, because of the acoustic “imperfection” of the instrument. This will mean a slower bow speed and also a sense under your ear of a little more texture in the sound than you may be accustomed to on the violin. Each instrument is different, and you will need to either record yourself at some distance from the instrument or play for a trusted friend sitting a ways away to know for sure, but usually the slight grittiness of a centered sound on the C string will go away only a few feet from the viola, leaving a sound with beautiful richness, depth, and a penetrating quality really necessary to get that register to speak at its clearest. Most violinists switching to viola err on the side of too far from the bridge, not too close. Also, notice that I didn't say that you need to lay huge amounts of weight in the string to play right up against the bridge. You will need only minimal weight to play piano or pianissimo there, but you can still get a beautiful sound. Now for the other part of our equation, keeping the weight where you want it. The shoulder is our largest bow arm hinge, and it creates a big challenge. Tracking a good sound requires keeping the contact point you want through the entire length of the bow, creating a straight line. But the arc of our arm moving from the shoulder is a curve! We don’t want our bow to curve over the strings at all. So, mathematically speaking, we need to find the counter-shape to that curve in order to end up with a straight line. In practice, this means that in order to play with a straight bow, maintaining a contact point from frog to tip, it will feel as though you are bowing with a slight reverse curve, to counteract the natural arc of the arm. This is the curve that starts at the frog with your right hand balanced to the back of the hand and wrist tilted a bit to the right, and ends out at the tip with the wrist curved to the left (and pronated as well) and the arm stretching out more to the front than to the side. It helps to imagine this curve like a cardboard cutout of a half moon lying flat on the strings with the curved edge constantly hugging the resistance of the bridge throughout the stroke. Last time we talked about having a setup that allows your viola and your bow arm to both leave the torso at 45 degrees. It is in the moment of producing sound at the contact point that the benefits of this approach become clear. We are able to more easily create this consistent contact point with the instrument slightly in front of us, because our right arm can more easily reach out to meet it while maintaining the “reverse curve” if the instrument isn’t too far over to the left. This setup helps maintain a good “arm geometry,” something that will look natural and comfortable in the mirror. The other elements to arm geometry are keeping your right elbow at the right height for each string so that when you play, your elbow hinge is able to do most of the work (as in a detaché stroke in the middle of the bow, which is almost entirely hinged from the elbow). Sometimes violists drop their elbows too low to be able to use this hinge, thinking that a low elbow level will allow them to drop more weight into the string. If you maintain a bit of structure in your wrist as you play, you should be able to keep your elbow at a good height while simultaneously letting your arm weight drop from the shoulder. The string itself, and your engaged wrist, will hold your elbow up! The road to good viola playing is paved with… whatever you want it to be! 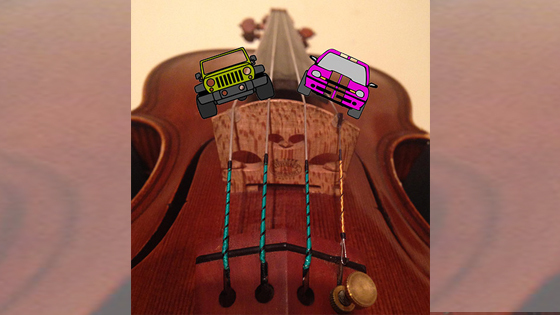 On your journey towards making the viola your own, make sure that whichever road (or string) you happen to chose, that you stay and enjoy the ride! Next time: "Help! I’m tense about my tension!" November 27, 2015 at 09:56 PM · I see from my comment to your first viola blog that I am 8 months into my viola journey. I still haven't plumbed the depths of viola nuances but there are two things that your current blog touches upon: 1) response differences in strings. When I was trying out violas and posted a question about them to v.com, there were complaints about what one may call the deficient response of the D string. As I practiced, I noticed my D string sounding better and better without doing anything special. 2) need for arm weight to produce a good tone, and using the fingers of your right hand. The more I practiced, the more pain I felt in the tendons of both my right and left thumbs. I realized that the right hand pain was being caused by using my hand too much to produce bow pressure. Using my arm weight helped a lot, and also helped my tone production, but using my fingers more caused the weight to shift more from my hand to my fingers. With my hand, all the pressure came from one spot, but different fingers exert pressure at different points on the bow hair. November 28, 2015 at 12:47 AM · A wonderful blog! As a cellist taught by a teacher who was a performing professional on both cello and viola, and being now a violinist who has also been taught by a performing professional, I feel sorely tempted to take up the third instrument. My DFA (Domestic Financial Adviser) would, however, need considerable persuasion in the matter! November 29, 2015 at 05:34 AM · Ha, Ha. Well at least you wouldn't need a third teacher. I would be tempted to take up cello (third for me) but the biggest problem would be where to put it. I traded in my first violin for the viola so it just took its place. And if cost of the instrument is the only issue, if you're not looking for something commensurate with your other instruments, it wouldn't be hard to find a viola that won't break the bank. My very decent Bulgarian viola cost $2200 and I would have been happy with the J Haide that cost just under $2000. Many v.commies seem to be happy with their Yita violas that cost a good deal less. Look for the question I put out in the viola discussion back in March. November 30, 2015 at 07:42 PM · Trevor, take the plunge, you won't regret it! (I can't help with the DFA however...) Francesca, it's wonderful that you have stuck with it and have discovered on your own ways to release tension and get a better sound. I completely agree about relaxing the thumb, in my experience the base of the thumb is almost like a "keystone" muscle that, when released, opens up tons more release and sensitivity into the fingers of the hand. Your feeling that the right hand fingers change relative importance depending on where you are in the bow (and which string, and which contact point) is spot on. Keep going, you are your own best teacher! November 30, 2015 at 10:03 PM · Thanks for your blogs and the encouragement, Jonah. Fortunately, a lot of the things to be aware of are the same as for the violin, but their importance is magnified because of the larger and heavier instrument. Kate Little mentioned in a recent blog how not paying attention to the ergonomics can lead to severe and permanent disabilities. But your latest blog is dense in advice on tone production. I'm going to print it out to be sure I eventually absorb everything. December 1, 2015 at 03:55 AM · I just bought a viola. I haven't seen it yet. Someone I trust picked it out for me. I can't wait to get my hands on it. December 1, 2015 at 08:59 PM · Excellent article! I've been playing viola for three years now and everything you say is spot on. I'm enjoying the feel of my arm weight transferring through my wrist to the bow, so I can really dig in to the strings in the way that the viola demands. However, encouraged by my teacher, I've also been discovering the joys of tilting the bow and moving closer to the fingerboard with less weight, to get a softer sound when it's called for. Although I now consider the viola to be my primary instrument, I still play a fair amount of violin (and fiddle). Making the switch takes a bit of adjustment to the lighter, more delicate touch that the violin needs (not to mention the closer note spacing). But it's still fun to occasionally pull out the viola at fiddle jams and watch people's reactions to that C string. December 2, 2015 at 06:02 AM · Paul, how exciting! Do tell us about it when you have something to say. I admit--I still owe a blog about my viola.